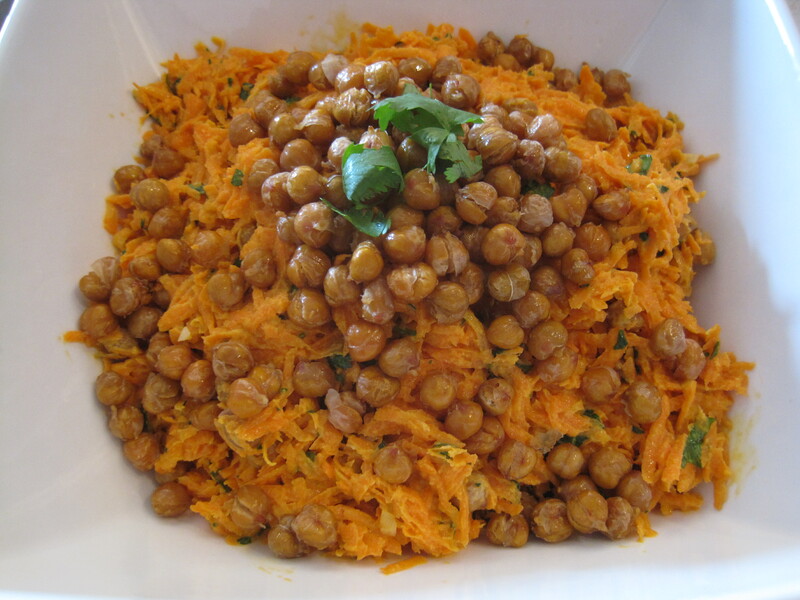 Place the dried chickpeas in a large bowl and cover them with at least two times their volume of cold water. Soak over night. Then place the chickpeas and water in a large pot and bring it to a boil over high heat. Once the water reaches a rolling boil, reduce the heat as necessary to maintain a strong simmer. Cook the chickpeas until pleasantly soft, about 45 minutes. Then drain well and dry on paper towels. Preheat the oven to 425 degrees F. Toss the chickpeas with 2 tablespoons of vegetable oil, a pinch or two of salt, and ground cumin. Spread them out on a baking sheet and roast them in the oven until they’re browned and crunchy, about 20 minutes. Toss them half way through. Then set aside. Meanwhile, whisk together the tahini, extra virgin olive oil, garlic, lemon juice, and a pinch of black pepper. Whisk in the water, one tablespoon at a time until your desired consistency has been achieved. Taste test and adjust the seasonings to taste. You may want to whisk in a tiny bit of maple syrup to taste. The goal is to just slightly cut the acidity of the lemon, but keep in mind that the carrots will add sweetness to the salad as well. Personally, I like keeping the dressing tart. Place the grated carrots in a large bowl. Add most of the chopped parsley and toss in the dressing. Add more salt and pepper to taste if needed. Store the salad in the refrigerator until ready to serve. This can be made up to 2 days in advance. Just prior to serving, add as many of the roasted chickpeas as you’d like. Sprinkle over the nuts and remaining parsley as garnish. Serve cold or at room temperature.